Family: Asteraceae/ Compositeae – daisy family. Botanical features: Herbaceous perennial with single yellow flower heads each made up of numerous florets on unbranched, hollow stems. Leaves are toothed or deeply lobed and form a basal rosette growing from a mostly unbranched taproot. The fruits are borne on silky pappi forming a globe which is easily blown apart by wind or by wish-makers alike. Dandelion flowers are surely one of the most joyful sights at this time of year, carpeting roadsides and fields with their merry abandon. They have long been considered heralds of the return of the sun, blooming in spring, opening with the day and closing at night. True to form, this last week they have remained stubbornly closed in the incessant grey-skied drizzle. 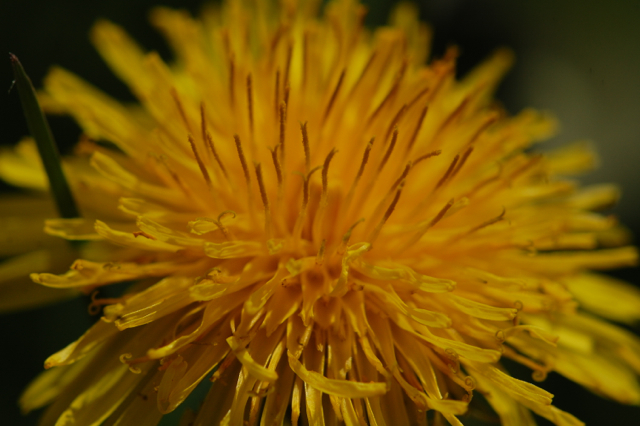 Dandelion is another of those plants that blurs the line between food and medicine as all parts can be used for culinary and medicinal purposes. It is not without irony that plants commonly viewed as weeds like nettle and dandelion are some of the most nutritious foods and helpful medicines we have available to us. The sorry result of living in a time and place of seeming plenty is that we forget to give value to that which is most worthy of it. Dandelions should always be encouraged in our gardens, not just for our own wellbeing but because they also support a variety of butterflies, moths and other insects. Look closely to see how each flower is actually a flower head comprising many individual florets. 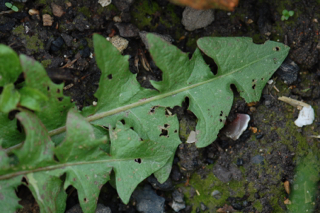 This is a feature common to members of the asteraceae family. 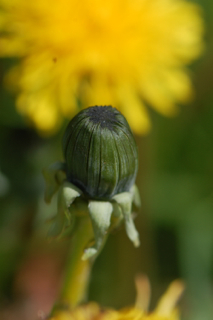 The actions of dandelion are many and varied but include; hepatic, cholagogue, diuretic, alterative, anti-rheumatic, aperient, tonic, nutritive and digestive. Dandelion flowers are the part least used in medicine but they do have some of both the cleansing and nutritive properties of the leaf and root. They are good infused in apple cider vinegar, either alone or with the whole plant, left for a month to six weeks and then strained to make a useful addition to salads, stir fries, soups and veggies. They also make a lovely infused oil but be careful to pick them on a dry, sunny day when all the dew has dried as the high moisture content can easily spoil your oil. This is commonly used as a rub for fatigued and aching muscles after infusing for a week on a sunny windowsill and then straining. I like to combine dandelion, St. John’s wort and rosemary infused oils to make a warming and healing massage oil for everyday back aches and pains. Susun Weed also recommends it as a breast massage oil which is interesting because the greens were used in the past as a poultice for swollen breasts and breast cancers. Dandelion flower fritters are a wild food staple and Danielle has a lovely recipe for them here. You can also learn to make dandelion flower wine with Rosalie here, something I have yet to try! Do take a little care when picking though as the milky latex contained in the stem can cause contact dermatitis in some sensitive individuals. The leaves are tasty in salads when used sparingly. They are bitter so I tend to just use a few amongst the spicier tastes of mustards or wild garlic and the sweeter taste of lettuce but if you want the full medicinal effect then you can make a salad consisting entirely of dandelion leaves. I recently came across this wonderful video from 94 year old Clara about how she makes her dandelion leaf salads, definitely worth checking out! Culpepper recommended it as a pot herb, made into broth with a few Alexanders. Alexanders are growing freely right now so it’s a good time to give this a try. The leaves are one of, if not the, primary diuretic used in modern herbal medicine. They affect the water balance in our bodies by encouraging excretion of excess fluids but they also strengthen the entire urinary system. They are well known for their country name Pissabed, or the French pissenlit, but interestingly they were also used in the past to treat bed wetting and incontinence, as well as causing it. They are a useful addition to a constitutional formula where there is oedema due to heart failure or high blood pressure as they will not aggravate the cause whilst treating the symptoms as pharmaceutical diuretics have been shown to. This is because, rather than depleting it, they restore the body’s natural balance of potassium as the areal parts of the herb can contain as much as 4% of this vital mineral. Dandelion greens also contain iron, calcium and a host of vitamins including A, B’s and C.
As well as being eaten in foods they can be dried and added to teas or made into tincture. They can vary in size and colour depending on where they grow as this page from my journal attempts to capture. The larger, leafier ones are nicer in salads in my opinion as the smaller, darker leaves can be a little tough. The root of dandelion is the part that is commonly used to support the liver and gallbladder though the whole herb has enough bitterness to get the bile flowing and tone digestion. All tap roots have a nourishing quality to them as they act as a storehouse for vital nutrients and dandelion’s roots go deep into the earth to access minerals held in the subsoil. It is a helpful medicine anywhere that there is heat or stagnation in the liver as it demonstrates, in Cupepper’s words, an ‘opening and cleansing quality.’ It both stimulates the release of bile from the gallbladder and the production of more in the liver so it can help in our ability to digest fats and can also work as a mild laxative or aperient by toning the whole digestive system. Moving liver congestion can help our bodies to work more efficiently on many levels and assist in conditions from headaches to skin conditions to foggy headedness and inability to concentrate. 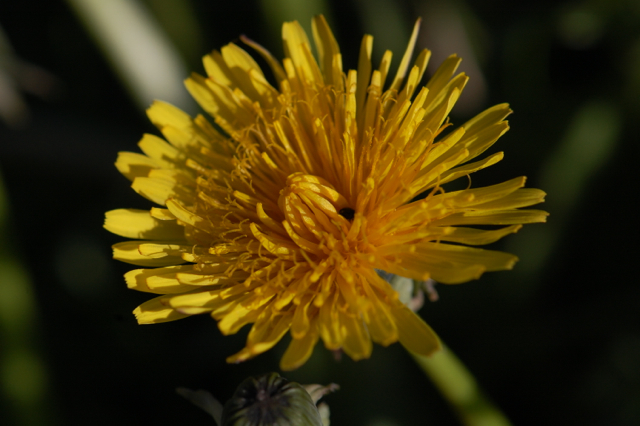 The liver also processes hormones so dandelion root can be very helpful in PMS and other hormonal complaints. Dandelion root is an excellent tonic for the pancreas as it works on both the exocrine and endocrine functions of this important organ. By stimulating the release of gastric juices it aids the digestive capacity and by increasing insulin secretions it helps to balance blood sugar levels. Roots are commonly harvested in autumn or spring. In autumn the long tap root is busy storing nutrients and polysaccharides away for the winter and the resulting medicine will be sweeter and richer in inulin so more appropriate for people who need building and nourishing, general digestive support or help balancing blood sugar levels. In spring the roots will be nice and bitter and great for people who have symptoms that indicate more heat and inflammation in the liver. Having said that most people can benefit from a more stimulating bitter in spring and a more nourishing bitter as the cold months come around so there is something to be said for making batches of both to use at the appropriate time as well as just looking at the energetics of the individual. The energetics of dandelion are interesting. It is considered cooling due to it’s bitterness, and drying, primarily for its diuretic properties. Therefore it is often used for people who are hot, red faced, liverish and irritable, swollen, stressed and with high blood pressure. For the most part the leaf does tend more towards the cooling, drying and cleansing end of the spectrum but the root I find to be more complex. I currently have three dandelion tinctures sat on my shelf and each one is completely different from the next. This is partly due to the time of year they were harvested as explained above but also due to other environmental factors. One of the tinctures is so thick, sweet and nutritious that I would almost classify it as moist rather than dry and would always think to use it for people who were depleted, weak or fatigued. This is one reason why it’s so important to taste your herbs and get to know them rather than assuming all dandelion tinctures will be the same. I happily use dandelion root for a variety of people who need some liver support, though I would balance it with other herbs as appropriate to the individual. Dandelion has often been associated with joy and I like to think it encourages happiness both actively, through the unfettered cheeriness of its flowers, and passively, by releasing anger and emotions held in the liver and allowing the happiness that is naturally our nature to shine through. Everyone enjoys a few dandelion leaves in our house! Thanks Lucinda…such a cheerful flower. I enjoy a cup of dandelion and burdock tea in the evening and feel the release of any unwanted toxins in the morning. That sounds like a very wise habit to get into, it’s so often the simple things we do everyday that make the difference isn’t it. Are you using the root, the leaf or the whole plant? I generally feel it can be used long term for most people and will be especially beneficial if you don’t have a gallbladder. Also are you using it in food, tea or tincture? An average dosage would be 2 or 3 cups of tea daily or 5 ml tincture but it does depend somewhat on the individual. There has been a lot of interest in dandelion for cancer recently and I’m sure we’ll see more research coming out! I drink dandelion tea and add the petals and odd leaf to salads. I made a ground ivy tincture during the week. Today I shall make dandelion. Tku for your guidance……….and have a lovely bank holiday Monday. Yes isn’t she lovely, it’s all those dandelion leaves I expect! 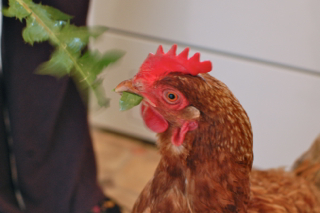 She loves chicory too and heads straight for the clump of leaves whenever I let her out in the front garden. We had a ray of sunshine about an hour ago but it seems to have gone already. Sigh. Lovely article, Lucinda. Thank you. I have this very morning had an e-mail from a friend forwarding an article about $217K funding for research into dandelion root extract to treat aggressive cancers. A synchronicity I cannot ignore, as I have three people very close to me recently diagnosed with cancers. That is an interesting synchronicity. Please email me the article when you have time as I’d be interested to read it. I hope your loved ones are doing ok and might be open to taking the herbs. there is always so much passion in your posts! dandelion is one of my favourite plant as well and having all these nice information about it all together it’s been a blessing! I particularly loved your Culpepper quotation and reminded me how shocked my mother was when she saw me making a salad with tarax leaf and other seasonal goodies!she thought of it as a weed and the idea of having it as food never occurred to her!she changed her mind after I’ve been “communicative of the virtues of plants”! Yes, it is interesting isn’t it, I think it is somehow the nature of the human mind to assume there is always something better or bigger or more out there. That is why Buddha said ‘life is dissatisfaction’! I think it’s really fascinating how medicines change according to location, season, year, etc. I often think there is much more subtle information in this than I currently understand. I hope you had a nice dandelion salad! Ohh now I haven’t had a go at making a dandelion flower infused oil yet – if the weather ever dries out enough, I shall be giving that one a go! 😀 And did you do those dandelion leaf paintings?? The rain is starting to feel a bit depressing isn’t it! Very nice salute to a beloved neighbor (well at least to us plant people, some of my human neighbors seem immune to its charms) to almost all of us. While I always liked looking at them, I have to admit it took me a while to warm up to them as medicine and work. But once I re-discovered my lost taste for bitter I began to truly appreciate it. Nowadays, I love sauteing the leaves with carrots as part of my yummy meals. Recently I collected Dandelion flowers with my 2 year old grand daughter and we had fun making and eating Dandelion and oat cookies. I have also ventured to make salads with both leaf and flower additions,cooked some leaves, blanched, then saute with Tamari, garlic and olive oil. The Dandelion flower vinegar and oil look beautifully golden on my windowsill. I am really keen to make a fresh Dandelion root tincture. I have a recipe that says to use 100% vodka, but I can only find 40% in the shops. Is 40% as effective enough? Ummm dandelion and oat cookies sound lovely! As do your dandelion leaf dishes. I think the Americans have a different way of measuring alcoholic percentages to us, so they say 80% proof which means 40% alcohol by volume. I don’t really understand it myself! 100% alcohol by volume would make a horrible tasting tincture, you only need to use such high proportions for resin containing herbs. 25% is the amount of alcohol by volume usually used for dandelion leaf or root tinctures so you can use your vodka and even water it down a bit. 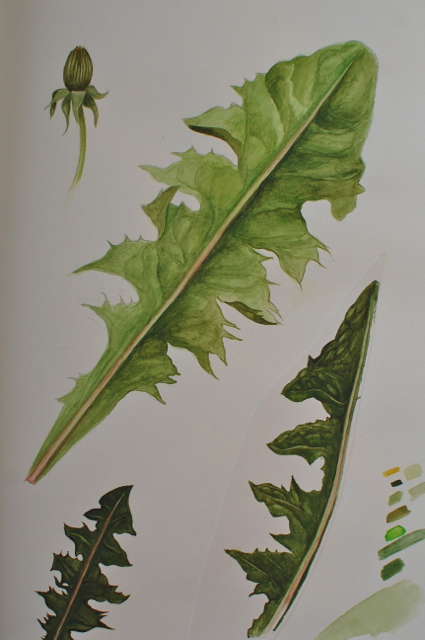 I have just read that you painted the dandelion leaves…..they are beautiful, keep going, you are an artist……. Leslie, I love hearing about your kitty cures, Wisteria sounds like she is in very good hands, I’m glad she is improving. How do you give her the infusion? Will she drink it or do you use a syringe? I am having difficulties getting herbs into Firefly as usual! Hello Lucinda, I love your blog! 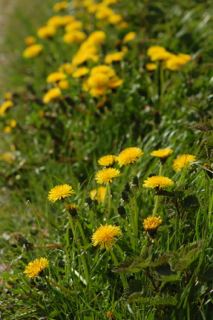 There are a couple things I’ve been wondering about dandelions: First, I had to have my gallbladder removed years ago, and I’m wondering how the dandelion affects bile when you don’t have a gallbladder. I can’t see any reason it should be a problem as I still make bile, I just can’t concentrate it as much. What do you think? Second, I have read that young dandelion leaves are less bitter, but am not sure how to identify the relative ages of leaves. I know some are smaller than others of course, but are there other identifying characters to look for? I have searched for this information but have never found a clear answer. I ate a mature leaf once and found it unbearably bitter. Perhaps it’s an acquired taste? Also, are less bitter leaves therefore weaker? Usually the young leaves are a paler, slightly brighter green and the darker coloured ones are older, more bitter and tougher. Certainly in my garden the new plants come up a paler green, a bit more like the big one in the painting above. The young leaves are still bitter and are very nutritious but do have a milder, more palatable taste. It is probably even more important to have bitters like dandelion if you have had your gallbladder removed as they encourage production of bile in the liver as well as just it’s release from the gallbladder so there will be more available to help emulsify fats even if you don’t have that concentration provided by the action of the gallbladder. @pennydreadfull, not to answer for Lucinda but I also had my gallbladder out and had the same problem finding any information about how dandelion might work in that case. So I asked Lucinda the same question. 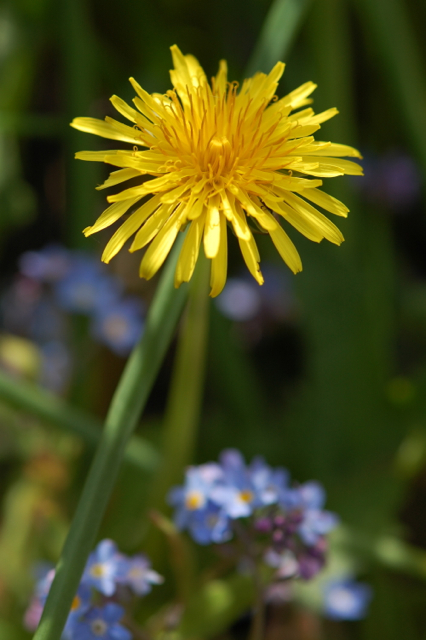 Hi Lucinda – I am making dandelion tea and was wondering what other herbs could be added to it. I remembered reading a post of yours and came back here to this one. Love the search feature of your website. Do you have any suggestions for herbs that can be added to dandelion tea made from roots? I’ve been instructed to roast and grind the roots, then add a teaspoon to a cup or two of water, bring to a boil, and simmer for 45 minutes. I’m over-run at the moment with lemon balm and wondered, too, if it would be good in the tea. I’ll experiment of course, but thought I’d start with your wisdom.